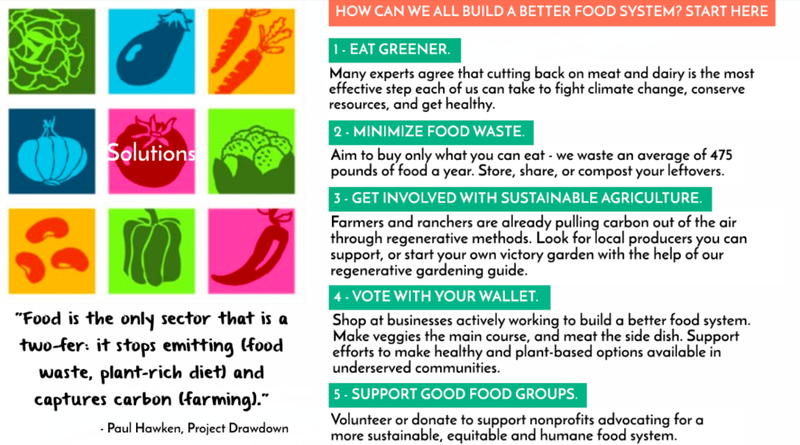 Our books and news highlight environmentally sound, climate-friendly, and humane ways to eat, grow, and dispose of our food, because the alternatives are simply unsustainable. "When people picture threats to the environment, they tend to picture cars and smokestacks, not dinner. But the truth is, our need for food poses one of the greatest dangers to the planet." "Meat consumption is a major driver of climate change, the extinction crisis and many other environmental problems." "We’re trading enormous greenhouse gas emissions for food to feed the planet. Between clearing land to farm and the farming itself, that’s 21 percent of global emissions—much more than the carbon spewing out of every car, plane, and train on Earth." If the average person on Earth swapped out 30 percent of the beef, lamb and goat meat they eat in favor of plant-based options, we could achieve half the reductions in greenhouse gas emissions from agriculture necessary by 2050. The top five meat and dairy companies emit more carbon than the gasoline giants. "[Factory farming is] the number one contributor to pollution. More than cars. If you care about the environment, you should care about factory farming and changing farming practices." – Natalie Portman, Co-Producer, "Eating Animals"
Soil carbon sequestration through regenerative agriculture is a known, proven, technical, remedy to global warming: it gives humanity the necessary time to decarbonize. "Agriculture is an avenue to so many solutions. We can store more water. Restore biodiversity. Capture more carbon. All we have to do is make a few modest changes in the way we farm." Infographic designed by Lydia Chodosh. "If everyone in the US skipped meat and cheese one day a week it would have the climate benefits of taking 7.4 million cars off the road over the same period." "Anyone can work towards reducing food waste and adopting plant-rich diets, two of the most powerful climate solutions at hand. Farmers can draw on a suite of techniques that benefit the climate...Farmers, urban growers, backyard gardeners, and all of us eaters can, and will, lead the way."